My next retrofit will hopefully be the power folding mirrors. I started with the necessary master switch module I picked up on fleaBay for $79 delivered in excellent shape out of a 2005 and is already installed. After days of researching the proper mirrors needed and reading about all the microswitch and gear failures in the design, I am thinking new mirror assemblies will be the best course of action. So, here is my question. I pretty sure I have the basic heated and tilt/memory mirrors without anti-dazzle and I have the sport package and the mirror backings (triangle mounting to the doors) are gloss black. I ran my VIN at BMW VIN decoder and no listing for mirrors. (LU37432) ECS Tuning has the basic power fold mirrors, heated with tilt but they are not gloss black for the sport package. My dealer could not provide any information on the auto fold sports package mirrors. Does anyone know of the proper part number for the basic auto fold, heated, memory/tilt in gloss black mounting back for the sport package? Last edited by Overboost; 12-16-2017 at 02:40 PM. Go to one of the online part database sites like realoem.com, bmwfans.info, or etk.cc and DO NOT input the last 7 digits of your VIN (LU37432). When you input your VIN, the part database becomes "specific" and will hone in on how your specific BMW was optioned...and not list all available options for that model/model year/build date. If you input data for a 2004 X5 3.0 with a 4/2004 build date...then go to the diagrams for the exterior mirrors...click on the the diagram for mirror housing for X5s with option codes S430a (int/ext dip) & S760a (high gloss). Do the above and you'll see there are MULTIPLE selections for the various options...you'll see a choice for "yes" or "no" for the option codes you have. If you want exterior mirror assemblies for sport pkg w/high gloss (S760a)...then make sure the supplemental column says "yes". And you also want the auto dim exterior folding mirrors...then also make sure the supplemental column says "yes" for that feature, too...as well as "yes" for any other features you have (heat/fold/high gloss/dip/etc). Last edited by Qsilver7; 12-16-2017 at 05:20 PM. 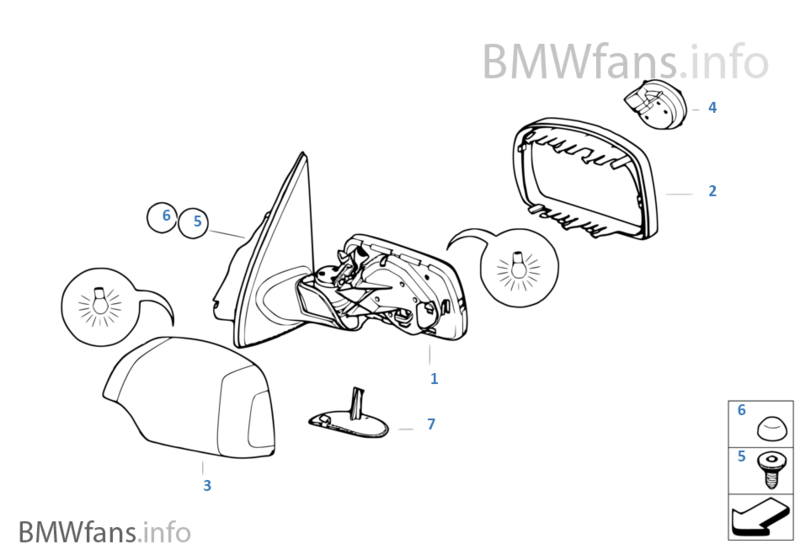 I did go and browse the RealOEM site and followed the build 04/04 3.0 and I do not see any reference to folding mirrors. I think you may be onto something. So I input 4.8 04/04 build date and I think I see what I am after although all the different options show the same part number. Let me know if you think I missed anything. Thanks for your help! You are correct with the part numbers...but your realoem.com link is the wrong diagram. You selected the diagram for option code S760a (which was under "GLAZING"...you need to scroll down further to "OUTSIDE MIRRORS" and select the diagram group that says S430A & S760A. Last edited by Qsilver7; 12-16-2017 at 09:21 PM. OK, next question if anyone knows the answer. In preparation for the power fold mirrors, I coded my GM3 for SPIEGELEINKLAPPEN to active. Does anyone know if the vehicle order needs a $313 option (folding mirrors) added on an X5 E53? Does anyone know which modules store the vehicle order on X5 E53? *EDIT* I think I found the answer to above question. Cluster and EWS. Last edited by Overboost; 12-17-2017 at 09:10 PM. Didn't look into that, but it seems right. I'll look into it when I connect to the x5 next. Wow, a serious headache reading how to change the vehicle order in the E53. Our E53 uses the old ZCS vehicle order structure and is not as simple as changing it like my later model E46. Apparently I need Zeko software to make the changes and then have to code the modules and entire car with NCS using checksums. One mistake and you brick the EWS. Not too confident in changing this myself. Anyone else ever done this? Last edited by Overboost; 12-17-2017 at 05:21 PM.